June is a month to embrace and love! Days just seem to last that little bit longer and life feels somehow more relaxed. There is a distinct draw to spend as much time outside as possible on walks, in gardens, splashing about in rivers, getting on a horse, pedalling about, and eating outside. Searching out the wicker hamper in the attic with its leather straps half frayed, the checked napkins, coloured tumblers, mish-mash of plates, old salt and pepper pots and odd numbers of cutlery is always worth the time. 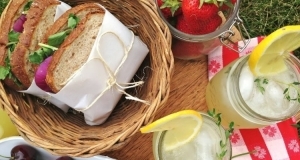 A picnic, whether planned or impromptu is one of life’s simple pleasures. The Cotswolds has a knack of making a picnic outing pretty special. There are so many gorgeous places to pitch up and pour out the home-made lemonade. Here’s three of the favourites for starters. Climb up here and you can see for miles – 16 counties on a fine sunny day. Take a wrap or blanket as it’s one of the highest spots in the Cotswolds and can be a bit chilly even when the sun is shining. Woods, footpaths, flowers, views and birdsong. Picnic spots aplenty. Ancient area on the Cotswold Way in an Area of Outstanding Natural Beauty with views that have not changed over the centuries. Lovely National Trust site and special area of conservation with wild flowers, butterflies, purple orchids. Views over as far as the Severn Estuary. Make a trip to award-winning Winstones ice cream parlour to finish off the picnic, made from the milk of cows grazing freely on the Common – they have been making gorgeous ice cream in the Cotswolds for over 100 years.